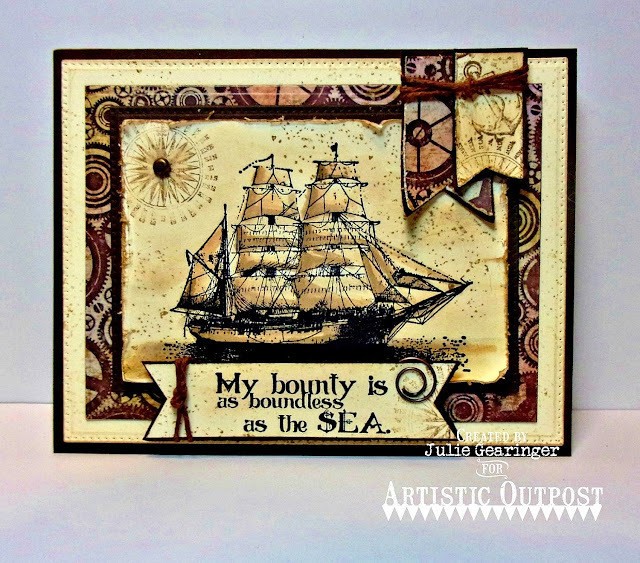 Today I am sharing one of the Artistic Outpost (AO) January 2017 Release cards on the Artistic Outpost blog and wanted to share the step by step details with you here as well. This card was designed with the new AO The Captain stamp set along with the new AO Vagabond Treasures Collection 6x6 Paper Pad, the previously released AO Grunge Elements stamp set along with the previously released ODBD Pierced Rectangles Dies and ODBD Rectangles Dies (all available from Our Daily Bread Designs). If you have not had a chance to visit The Artistic Outpost Blog yet, I encourage you to do so- gorgeous inspiration from the Artistic Outpost Design Team throughout the week on the AO Blog! 1). 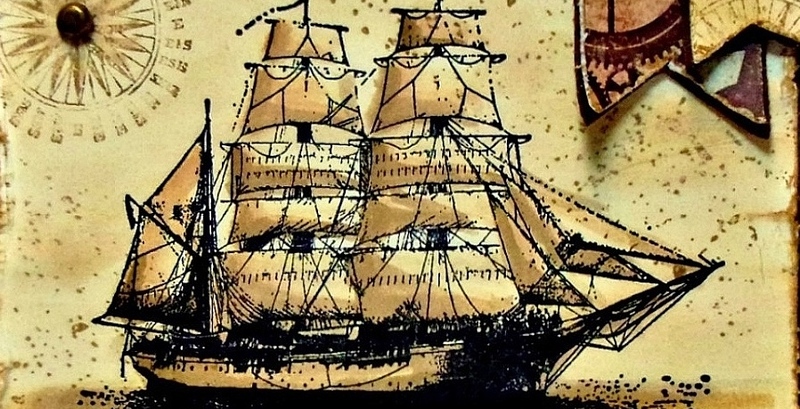 Ink the ship from the AO The Captain stamp set with archival black ink onto vanilla cardstock, water color with distress inks and add a bit of distressing with the large splatter stamp from AO Grunge Elements. 2). Ink the compass image from AO The Captain with distress ink and stamp onto the upper corner of the panel, trim the panel and distress the edges. 3). Mount onto a rectangle of espresso cardstock die cut and embossed with the ODBD Pierced Rectangles Dies. 4). Die cut and emboss a piece of the AO Vagabond Treasures Collection 6x6 Paper with the ODBD Rectangles Dies and a piece of vanilla cardstock with the ODBD Pierced Rectangles Dies. 5). Mount a piece of espresso cardstock to a white card base, add the die cut and embossed piece of vanilla cardstock, add the die cut and embossed AO Vagabond Treasures Collection rectangle and add the stamped AO The Captain ship image. 6). Create the banners by hand a). cut one from the AO Vagabond Treasures Collection Paper (I used a scrap from the rectangle cut) and a smaller banner from vanilla cardstock. Ink and stamp the anchor and compass image from AO The Captain stamp set onto the vanilla banner using distress inks, distress the edges with a distressing tool or your fingernail and add a bit of splatter to the stamped vanilla banner with the large splatter stamp from AO Grunge Elements. 7). Adhere the banners to the card front and add the knotted hemp twine. 8). Ink the sentiment from AO The Captain with archival black ink, stamp onto vanilla cardstock, create the fish tail banner ends and mount onto espresso cardstock. “Huff” onto the previously inked compass image and splatter stamp from step 6 and stamp over the sentiment to “distress” the paper. Add the knotted hemp twine and spiral clip before adhering to the card front with dimensional foam to finish off the card. Thanks again for taking the time to stop by- hugs to all of you and I hope you have a fabulous weekend! ODBDSLC282 Reminder- Winter Happy Birthday! 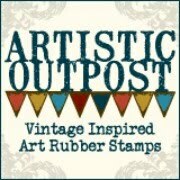 Artistic Outpost January 2017 New Release!